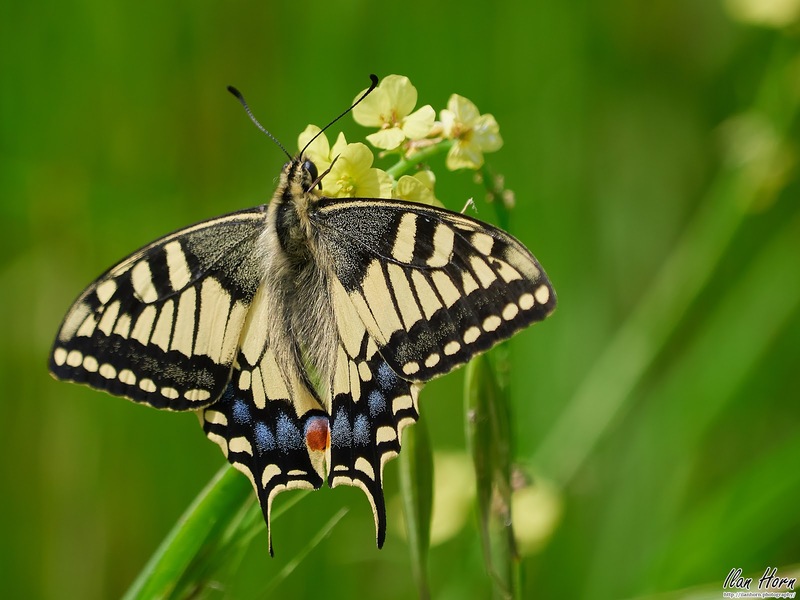 One of the most beautiful butterflies around - the Old World Swallowtail. Aptly named after the extensions at the back of its wings, that are very reminiscent of the tails of swallows. This large and colorful butterfly stands out wherever it can be observed. Here we have a photo of one feeding off some yellow flowers. What a nice encounter! What do I like about this photo? The amazing colors, with the green providing nice contrast to the yellow-black-blue-red butterfly. A great amount of details, right to the "hairs" on the body. I used an open aperture (f/6.3, the most open my lens supports at the focal length of 400mm that I used) to have a shallow depth of field, so the butterfly is sharp but the background is blurred out. The lighting is pretty good here, too, showing the beautiful colors. What would I want to improve? The tip of the left wing is a bit out of focus - I might have benefited from closing the aperture just a bit (maybe f/8.0? ).